SINGAPORE - Ambassador-at-large Tommy Koh was a man who represented Singapore on the world stage, but despite his high office, he was also known as a man of humility and humanity, who made time for everyone. Associate Professor Robert Beckman, from the National University of Singapore's Centre for International Law, recounted an incident when he took a group of law students from Singapore to the United States for a school trip in 1990. They were to meet Prof Koh, who was then ambassador to the US. "One of the students was taken ill on the plane, and almost lost his voice," said Prof Beckman. "The amazing thing was that the ambassador of Singapore showed up at the hotel, carrying a pot of soup made by his wife for the young law student from Singapore." 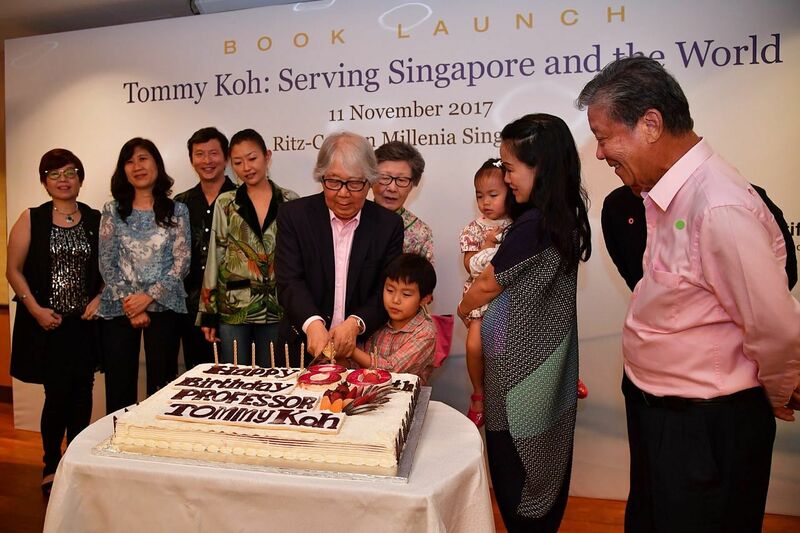 Prof Beckman was one of seven friends and colleagues of Prof Koh who spoke at the launch of a new book, "Tommy Koh - Serving Singapore and the World". The book, which celebrates Prof Koh's achievements and the impact they had on Singapore and the world, contains over 40 essays, each written by a contributor who had known Prof Koh or worked with him during his long career. It was launched on Saturday (Nov 11) at the Ritz-Carlton Millenia, a day before Prof Koh turns 80. Prof Koh has had a distinguished career spanning about five decades as one of Singapore's leading diplomats. At the age of 31, the law professor was appointed Singapore's Permanent Representative to the United Nations in New York. He would go on to hold posts such as Singapore's ambassador to the US, and would helm international panels such as the Third UN Conference on the Law of the Sea, and the UN Conference on Environment and Development. He was also chief negotiator for the US-Singapore Free Trade Agreement from 2000 to 2003, and was part of the team that successfully argued the case for Singapore's claim to Pedra Branca at the International Court of Justice in 2007. At home, Prof Koh is known for his important contributions to the development of the arts and for his contributions in building a compassionate society. But Prof Beckman said Prof Koh was also someone who had empathy for others, from junior diplomats, to cleaning ladies. "He makes everyone feel that they are welcome," he added. Emeritus Professor Koh Kheng Lian from the NUS Law Faculty said when Prof Koh was dean of the school from 1971 to 1974, he would make it a point to "know the names of every single law student". There were some 40 students a cohort at the time. "At convocations, he would read out their names without looking at a script," she said, adding that he was known for his "humility, humanity and his generosity of heart and soul". In terms of his professional achievements, Ambassador-at-large Chan Heng Chee said Prof Koh helped Singapore "establish a model of diplomacy" that diplomats continue to adhere to even today. Mr Arun Mahizhnan, Special Research Adviser at the Institute of Policy Studies, said Prof Koh was someone who was not afraid to voice his thoughts on issues like capital punishment, artistic freedom and environmental issues. The book launch was attended by some 200 guests, including Deputy Prime Minister Tharman Shanmugaratnam and Minister for Education (Higher Education and Skills) Ong Ye Kung, lawyers, members of the arts community and Prof Koh's friends and family. In a speech, DPM Tharman said Prof Koh had succeeded in advancing Singapore's interests and earned the trust of the international community because of a distinctive mix of qualities, which he called the "Tommy Koh blend". He described this as "your standing by the interests of Singapore as a small country, your ability to master and synthesise the most complex facts in a negotiation, and equally too your humility, and the disarming way in which you win people over." The book launch was capped off when a birthday cake was brought out and actress Selena Tan led guests in a birthday song. Speaking to The Straits Times after the event, Prof Koh said he was bowled over by the praise. "I'm lost for words," he said. "We need someone to criticise me to balance this, maybe my wife should've spoken," he added with a chuckle. The book is available at bookshops for $36 (excluding GST).